12 years and a lot of BISHOPS GREEN releases have passed since the last ALTERNATE ACTION record – “TOUGH TIMES” – was released, but the Canadians are back! 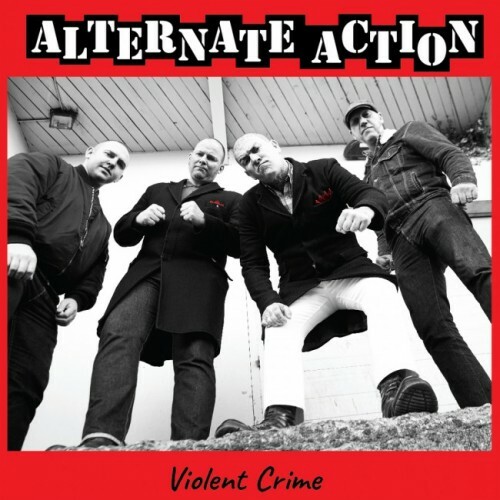 Not just with an European tour, taking the band trough Spain, Germany, Austria, Switzerland, France, Denmark and Holland, but with an all-new 12” as well – “VIOLENT CRIME”! Sounding rawer, darker and indeed, more violent than ever before, ALTERNATE ACTION bursts out one new anthem after another! Including the already praised title-track “Violent Crime”, and a re-recorded version of the scorching “Skinhead Way Of Life”, previously only available on a compilation, this hard-hitting 12” records holds a total of five massive tracks on the A-side, while the B-side is covered in a beautiful screenprint! An absolute must! Gregg Huff (Alternate Action, Lancasters and more) is back with a brand new band. Dark vintage stree..
TRACKLIST CD:1. Lost Generation2. Specter3. We Got Nothing4. Resistance5. Government Lies6. Dead and..
1. WAKE UP2. BURN THE BASTARDS3. TROUBLE4. DO ANYTHING YOU WANNA DO5. CHRISTMAS IN NEW YORK6. BURN T..
12 years and a lot of BISHOPS GREEN releases have passed since the last ALTERNATE ACTION record – “T..